Purchasing your first home is one of the most exciting times in your life that you’ll experience. You finally get to have a place you can call you own — a space that you can do whatever you please with since it’s yours. But being a homeowner isn’t just about painting walls whatever color you choose or to gain financial equity. There are a lot of responsibilities that are associated with owning a home, one of which includes taking proper care of the literal roof over your head. At Hometown Roofing, LLC., our team of Dallas roofers are highly trained and qualified to perform a variety of roofing tasks on your home’s roof. We specialize in roofing services that range from emergency roof repairs to entirely new roof installations. 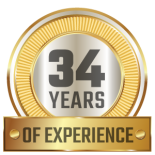 With more than 34 years of experience under our belts, we’re sure our local roofing company can get your roofing project done effectively and efficiently. Contact us today to schedule a free roof inspection! In this blog post, we’ll go over several important things you should know about your roof as a homeowner. 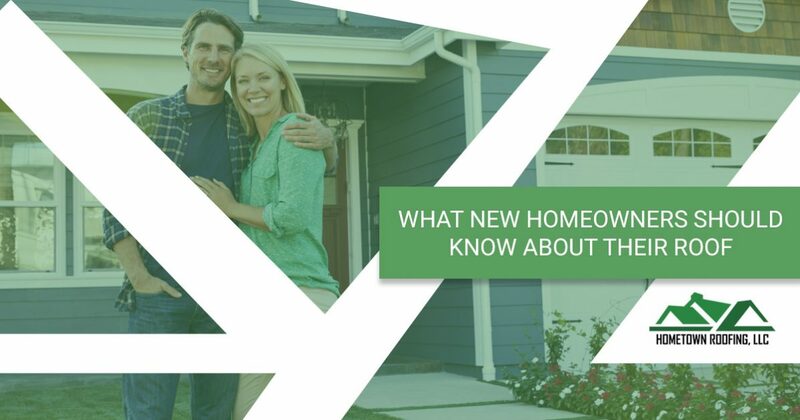 If you’re a first-time homeowner (or maybe if you were never told things about your roof in your previous home), continue reading below for more information! You need to have your roof regularly inspected. 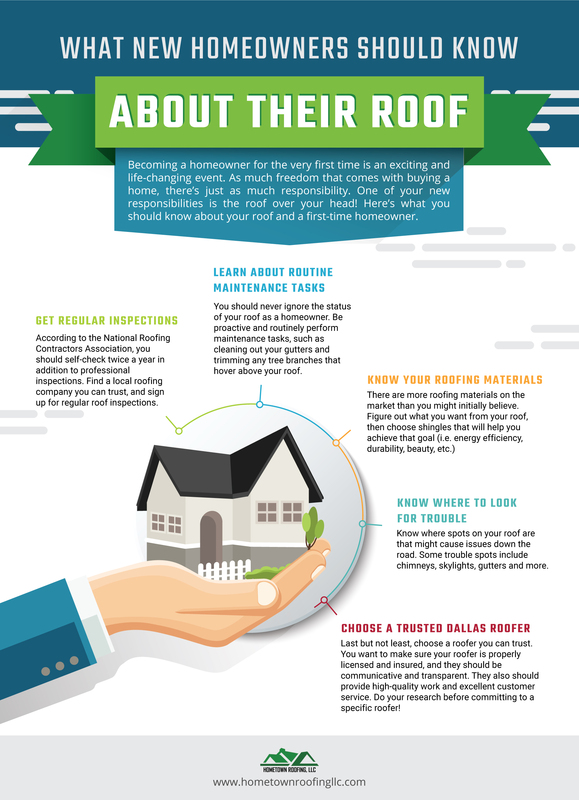 It’s rare that home inspectors actually climbed onto your rooftop to inspect every little inch of your roof before selling you your home, so you’ll want to ensure you sign up for a roof inspection right away and have your roof routinely checked at least twice a year after that. If possible, it’s best to do this before you purchase a home, just in case there’s something a home inspector might’ve missed that would change the overall value of the house. A professional roofer can assess your roof and suggest any necessary upgrades or repairs you might need in order for your roof to perform its primary function — keeping you safe. Learn about the regular maintenance tasks you’ll have to perform. As much as it might be tempting and easy to ignore your roof since it’s not something you’re regularly used to inspecting, especially if you were a renter beforehand, we recommend taking a proactive and preventative approach. Learn about any regular maintenance tasks you should learn to perform, such as cleaning out your gutters and regularly trimming any tree branches that surround your home or hover over your rooftop. You also want to regularly make sure your shingles are in mint condition, which you can do by literally getting on your roof to see how they look or by checking for dark wet spots on the interior of your home. Know your options when it comes to your roof materials. Roofs might seem like they all look the same, but roofing materials vary and boast different benefits. For example, asphalt shingles are durable and the most affordable roofing material on the market whereas tile shingles are a little more delicate but provide a better aesthetic appeal. Figure out what you want from your roof, and choose roofing materials that will help you accomplish that goal. If you’re the energy-efficient type, there are also shingles that will help you meet eco-friendly requirements as well. In fact, we can help you search for environmental roofing solutions — learn more here. Educate yourself on where to look for trouble. Your current roof, unfortunately, probably won’t last you as long as you plan to be in your home, especially if you plan to be your home for the long-term. In fact, most roofs will last you anywhere between 15 and 20 years, if you’re lucky. You can prolong your roof’s lifespan by educating yourself on regular pain points that you should check when something isn’t working quite as it should be. If your home has a chimney or skylight, there are two areas that are potential trouble spots for your roof, as the flashing around them can loosen and cause unwanted water damage. Clogged or damaged gutters also have a negative impact on your home. Ensure you choose a trusted Dallas roofer. There are a lot of roofers out there to choose from, meaning it can be easy to get sucked in by a roofer who will only cause you a mountain of headaches and who will try to trick you into spending more money than is actually necessary. Choose a roofer that is known in your local community for being reliable, for providing high-quality roofing work and for providing exceptional customer service. Your roofer should be communicative, transparent and trustworthy — do proper and thorough research before hiring any ol’ roofer off the street. Need some tips on picking the right roof repair company? Check out some of the tips and advice provided by our experienced professional Dallas roofers here. 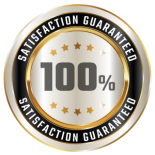 At Hometown Roofing, our jobs aren’t done until you’re 100 percent satisfied. 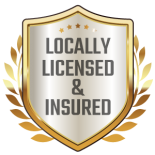 We are properly and locally licensed and insured, and we have an A+ rating from the Better Business Bureau. Let us help make your roofing experience as a first-time homeowner one that is enjoyable. You can reach us 24 hours a day, seven days a week by calling (888) 798-2917 or by completing our form online. We look forward to hearing from you soon!